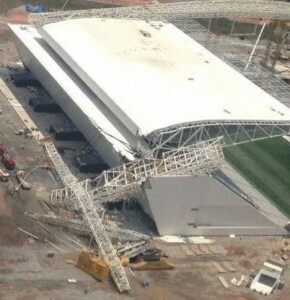 Liebherr has this morning issued a statement on the incident at the end of November at the Itaquerao Stadium in São Paulo, in which a 1,350 tonne capacity LR 11350 crawler crane collapsed killing two site workers. The statement says that all investigations conducted to date by Liebherr – including those at the accident site – have shown that the LR 11350 crane had no technical defects. It concludes that the ground was unsuitable and unable to carry the weight of the crane and the suspended load. Because of this the crane sank and the excessive inclined angle caused a massive overloading of the crane and the complete collapse. 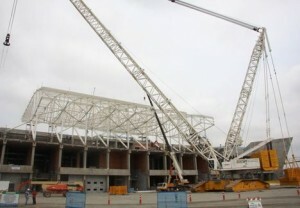 Liebherr says that an independent, internationally acknowledged crane expert has also come to the same conclusions. The company says the cause of the accident can be confirmed by subsequent static-load calculations and it assumes that all the reports currently being prepared about the accident will reach a similar conclusion. Analysis of the data logger by Liebherr has shown that it had not been recording data since November 2012 although it points out that the data logger cannot influence the crane functions.